Designed by Frank Gehry, Ar.D. ’00, MIT’s Stata Center is a striking two-towered academic complex that has drawn architectural attention. Every year, on a hot summer day, 10 Boston-area architects pile into a van together and drive around for hours looking for beauty. Lately, at least, they haven’t been finding it at Harvard. They are members of a jury assembled annually by the Boston Society of Architects to award the Harleston Parker Medal, a prize given to the recent building judged to be “the most beautiful.” It’s not the biggest, fanciest award in the world, or even in the world of architecture (that distinction belongs to the Pritzker Prize, sometimes referred to as “the Nobel of architecture”). But the Parker Medal is a good gauge of how architects—who are both the toughest critics and greatest appreciators of one another’s work—view the aesthetic quality of what’s being built around Boston. Since 2000, juries have recognized buildings on the Wellesley campus twice, at Northeastern University twice, and at MIT once. The last time a Harvard building was chosen was in 1994: the Law School’s Hauser Hall, designed by Kallman McKinnell and Wood. The aim here is not to compare institutions in a ferocious, competitive, why-hasn’t-America-won-more-gold-medals-in-these-Olympics sort of way, but rather to point out that, for much of the twentieth century, Harvard was perceived as a leader in modern architecture, so the absence of its newest buildings from the list of what architects consider “most beautiful” is surprising. So why isn’t Harvard still hiring amazing architects to design amazing buildings? In fact, the University has tried. During the past decade Harvard has given commissions to a couple of architects who are not just well-regarded but generally revered: Renzo Piano and Hans Hollein, both of whom have won the Pritzker Prize. Piano, best known for his museum work—the Pompidou Center in Paris, designed with Richard Rogers; the Menil Collection in Houston; and the recent addition to New York’s Morgan Library—was hired in 1999 to design a new museum for Harvard’s modern art collection. And Hollein, whose buildings in his native Vienna are described by design critics as masterpieces of urban contextual architecture (the adjective “jewel-like” comes up repeatedly) was asked to design a small building for the Harvard libraries. Ultimately, neither design was built. No matter whom you talk to—architects, people within the University, Cambridge residents—three things are clear. First, there are a lot of fights about Harvard architecture. Second, many of them aren’t really about architecture at all. And third, they are won not by the group that makes the most persuasive argument, but by the group that has the most leverage in the particular situation. The politics of site: Who gets to say what Harvard does with its land? The defeat of the Renzo Piano art museum on the Charles River began 40 years before the museum itself was even conceived. The parcel of land on which Harvard proposed to build the museum was adjacent to Peabody Terrace, the complex of low- and high-rise buildings constructed in the 1960s to house graduate students and their families. Designed by then GSD dean Josep Lluis Sert, Peabody Terrace has always been admired by architects (Leland Cott, an architect and a professor at the GSD, calls it “one of the world’s canonical housing projects”), but is generally disliked by those outside the profession, who find it cold and oversized. The neighbors hated it. The Riverside neighborhood was (and still is) a patchwork of small streets and modest clapboard houses. Peabody Terrace’s three 22-story towers cast a long shadow, both literally and figuratively. For years, front-yard fences in Riverside displayed, alongside the climbing roses, signs deploring Harvard expansion. Riverside activist Saundra Graham (who went on to become a Massachusetts state representative) famously disrupted Harvard’s 1970 Commencement with a protest against further development. In 1999, James Cuno, then director of Harvard’s art museums, announced plans to develop a piece of land next to Peabody Terrace that was owned by Harvard and occupied for years by a popular nursery business. Renzo Piano would design two new museums: one to house contemporary art, and the other for ancient, Islamic, and Asian art. Piano’s design concept called for two-story wooden buildings virtually hidden by a screen of trees. Boston Globe art critic Christine Temin wrote that when Piano showed her his plans, her response was, “So where is it?” (See “Down by the Riverside: A Progress Report,” May-June 2001, page 72, for images that the magazine has not been given permission to reproduce here.) The balance of the site would be used for University housing. Observers called Piano’s design “bucolic” and “tactful”—but Riverside neighbors, still angry about Peabody Terrace, petitioned the Cambridge City Council to stop the project. “Neighborhoods have enduring cultures,” says Kathleen Leahy Born, an architect who was a member of the council at the time. She remembers seeing pen-and-ink sketches of the Piano project. “You couldn’t tell much about it, but it was low. I thought it would have been a nice and very fitting use of the land along the river.” The neighbors were concerned about traffic, and proposed that the University scrap the museum and use the site for a public park. That proposal recalled what had happened 25 years earlier when a citizens’ group foiled plans to build the John F. Kennedy Library and Museum at the edge of Harvard Square. The I.M. Pei-designed project was eventually sited at the University of Massachusetts, Boston campus in Dorchester, and a park was built on the Harvard Square site instead, along with the Kennedy School of Government. Cambridge responded to the Riverside neighbors by imposing an 18-month development moratorium on Harvard’s proposed museum site. As Born explains, “A moratorium isn’t the same as a simple delay. It’s enacted with the understanding that the time will be used for a planning process.” Eventually, a compromise was announced. Harvard decided not to build a museum, and new zoning was put in place that would allow housing between three and six stories tall on the site. As a concession to the neighborhood, Harvard agreed to build approximately 40 units of affordable community housing nearby, and to donate $50,000 to neighborhood groups. The towering Peabody Terrace housing complex, built in the 1960s, rises behind older housing of a far smaller scale. “Exhilarating,” one Riverside activist told the Globe in 2003, after the compromise was announced. But had the neighborhood really benefited? Instead of a two-story museum in a park-like setting, they ended up with taller student dorms and a small public park adjacent to heavily traveled Memorial Drive. Though the riverside museum was lost, the University managed to hold onto the architect. Piano was retained to renovate and expand the Fogg, a project whose construction will not begin until at least a year from now. The Piano museum is just one recent example of a Harvard project running into opposition from a neighborhood suspicious of institutional expansion. Because the University is in the middle of the city, its boundaries are blurry. Outrage arises when Harvard earmarks for construction a site it owns but has not hitherto developed. Plans to fill in open space—such as the lawn behind the GSD, initially proposed as a site for the Center for Government and International Studies (CGIS), or the empty skyscape filled by One Western Avenue—or to displace local businesses evoke visceral resentments having to do with psychological, rather than actual, property ownership: a sense that something that “belonged” to the neighborhood suddenly belongs to Harvard. The CGIS project, designed by Henry Cobb, former chair of the GSD’s department of architecture, went through several years of sometimes contentious public process—unquestionably adding to the ultimate cost of the project and the time it took Harvard to complete it. One attendee at an early meeting remembers that Harvard tried to justify the building’s initial siting by saying the campus had nowhere else to grow—“Which was the worst thing to say. The reaction was, ‘Don’t make your institutional problems into our neighborhood crisis.’” The project was finally completed in 2006—on a different site, with its program split between two buildings (it was originally conceived as a single structure) on opposite sides of a busy street, and without the underground tunnel that Cobb and Harvard wanted to connect the buildings. Yet the University’s senior director of community relations, Mary Power, points to many successful aspects of the CGIS process. “The dialogue produced many changes that were acceptable to the University and responsive to the community,” she says. Harvard preserved the green space behind the GSD; planted 200 trees; decreased proposed building heights; and moved old wood-frame houses to the edge of the site, where they were renovated as University office space—a practice which Harvard frequently employs, both as a way to rescue old structures and to mediate between the scale of residential and University buildings. Power also cites two current projects where the public process has been going smoothly: the northwest corner of the law school, now in site preparation; and a group of new science labs bordered by Oxford and Hammond Streets, currently under construction. The latter project includes a building by Rafael Moneo, whose work, like that of Piano and Hans Hollein, other architects admire hugely. The politics of urban context:Who gets to judge whether a building fits in? Nobody, in the recorded history of the doomed Piano art museum, ever said, “I hate the building.” The aesthetic issue hardly came up: the battle was over siting and Harvard’s perceived encroachment into the neighborhood. The story began in 1999, when Harvard Planning and Real Estate announced it was going to tear down a couple of old buildings on Mount Auburn Street between J. Press and the Fox Club. The retail tenants—the Harvard Provision Co., Skewers restaurant, and University Typewriter—left cordially, but they were the kind of quirky small retailers whose passing dismays Cambridge residents (and Harvard alumni) who’ve lamented the gradual loss of the “old” Harvard Square to glossy chain stores and banks. After years of wrangling, the Center for Government and International Studies on Cambridge Street, which began as one structure, split into two and changed its site. For the Mount Auburn Street site, Hollein designed a five-story building whose façade was a sloping, undulating metal mesh screen overhanging recessed ground-floor shop fronts. He presented his design at a hearing before the historical commission in April 2001. Lee Cott, whose firm Bruner/Cott was affiliated with Hollein on the project, remembers the evening as “awful.” Cooper calls it “embarrassing.” The commissioners grilled Hollein on basic issues of aesthetics and functionality. Why did the building curve? What was the “goal or intent” of the sloping façade? Had he thought about the snow that would collect in the screen? Did he understand what Cambridge winters were like? Hollein, visibly tired and jet-lagged, replied that he had considered all these issues, that he’d made many models and used his judgment in the design process, that he had designed buildings in the mountains of Europe where there was far more snow. In a memo to the commissioners several days earlier, the commission’s executive director, Charles Sullivan, had called the building “inappropriately scaled” and “incongruous because of its aggressive indifference to its surroundings.” At the hearing, after a brief discussion, the commission voted 7-0 to reject Hollein’s design because it did not “complement and contribute to” its urban context in Harvard Square. There is also the question of a building’s symbolic and visual importance within the larger urban scene. Kathy Born says, “In a place like Harvard Square, you need buildings that fit in, but you also need punctuation. Some of Harvard’s greatest buildings are the oddballs: Memorial Hall, the Lampoon.” How does one decide whether a certain site needs an attention-getting “object” building, or a well-mannered backdrop? Some architects, for instance, believe Le Corbusier’s Carpenter Center would have worked better as a stand-alone building on a more prominent site (“Observatory Hill,” suggests one), while others feel that the building’s excitement and energy come from the way it’s jammed in between the serene red-brick Fogg and the Faculty Club. Ultimately, arguments about context boil down to taste. For everyone who says, “Yes, it’s contextual,” there’s someone else who says, “No, it isn’t.” In the case of the Hollein building, the power to decide rested solely in the hands of the Cambridge Historical Commission, which originated in 1963 partly in response to Harvard’s modern building projects (notably the Holyoke Center, whose “harsh exterior contrasted sharply with the comfortable brick vernacular of Harvard Square,” according to the commission’s website). Again, a public regulatory process trumped Harvard’s ability to build on its own land—and again, the public process had grown up partly in reaction to what and how Harvard built in the 1960s, the University’s single most explosive period of growth. The politics of branding: Who gets to define a “Harvard building”? Mention the Spangler Center to an architect familiar with Harvard, and two subjects will come up: the building, and the speech. The Spangler, a student center at Harvard Business School (HBS), was designed by Robert A.M. Stern. Currently dean of the Yale School of Architecture, Stern was a leading architect of the Shingle-Style Revival of the 1980s and is a respected architectural historian as well as a versatile designer whose work also includes modern buildings. The Business School’s neo-Georgian Spangler Center looks like a very nice country club—which can be read as either praise or indictment. Spangler Center is a neo-Georgian red-brick building with white trim. Located on one of HBS’s great lawns, rather than in a residential neighborhood, it was built without a lot of conflict, opposition, or drama. It looks like a very nice country club—which to some people might sound like praise and to others an indictment. But to Stern—and many would agree with him—the building is unmistakably Harvard. University insiders acknowledge that Harvard first turned its sights on Allston in response to the increasing difficulty of getting things built in Cambridge. The grass looked greener over there (but as has been reported in this magazine, the process has already hit a Cambridge-like snag, as neighbors objected to plans for a new art museum because they disliked its height and size and had not yet reviewed an overall master plan; see “Off the Fast Track,” May-June, page 64). The scale of the Allston campus—more than 200 acres, and up to 10 million square feet of construction—ensures it will provoke the same political questions that have dogged Harvard in Cambridge: the politics of site, the politics of urban context, and the politics of branding and style. In addition to the many voices within the University, there will be neighbors, civic groups, and city agencies, all of whom will use available planning and zoning tools as leverage to achieve their own ends. But the Allston campus also, inescapably, raises questions of architectural style, taste, and beauty. As Robert Stern says, many university campuses have a brand: think of Yale’s Oxford-inspired Gothicism, or Stanford’s Californian Mission-inspired sandstone, or the lean steel I-beams and glass of Ludwig Mies van der Rohe’s Illinois Institute of Technology. Should there be a Harvard brand in Allston? If so, what should it be? And what should be the interplay between the background buildings of the new campus (branded, or not) and its signature monuments? Harvard’s choice of Behnisch Architects of Stuttgart to design the first Allston buildings, a science complex, signals that whatever the overall look of the new campus, sustainability will be a priority. The Behnisch firm is renowned for expertise in “green” design. 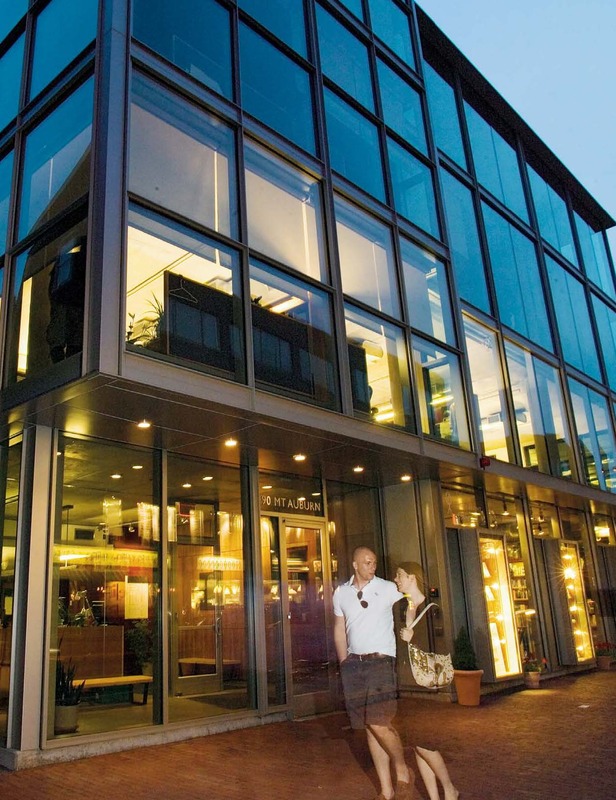 Their Genzyme corporate headquarters building, near the MIT campus, is a shimmering modern interplay of reflective surfaces and energy-efficient technology. Joan Wickersham’s column “The Lurker” is a regular feature in ArchitectureBoston magazine. Her memoir, The Suicide Index, will be published by Harcourt next year.